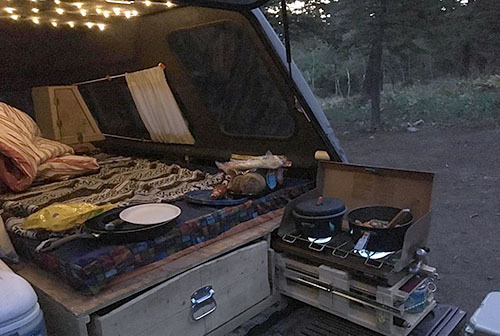 This truck conversion with shell provides enough space for a bed platform over heavy-duty slide-out storage and a kitchen drawer. 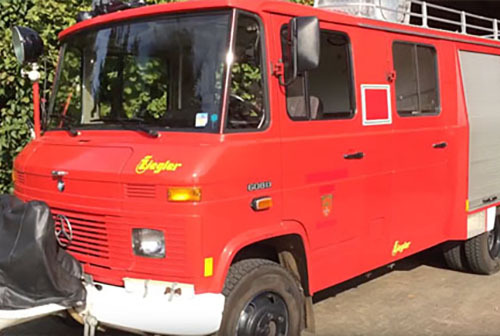 Be sure to check out Glenn's website for detailed descriptions of this fire engine conversion. 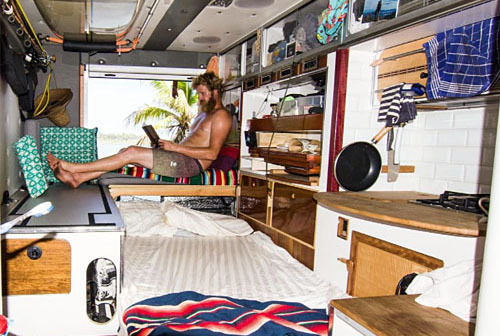 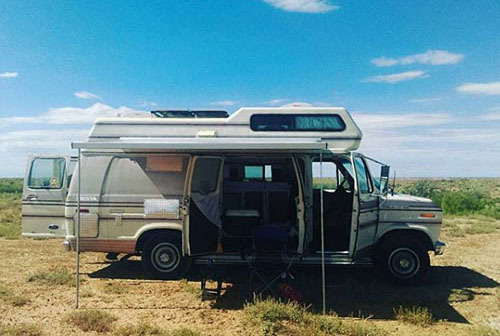 Sam's Sprinter-based "surf bus" van conversion is finished and he's commenced adventures. 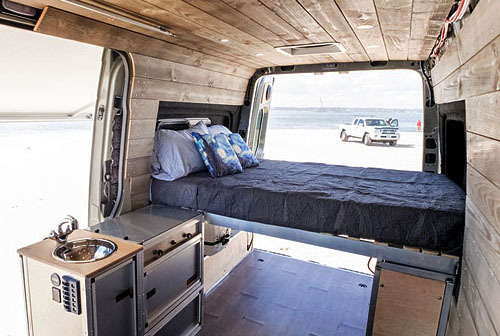 Of note in this very polished conversion is the cantilevered folding bed system made with birch ply. 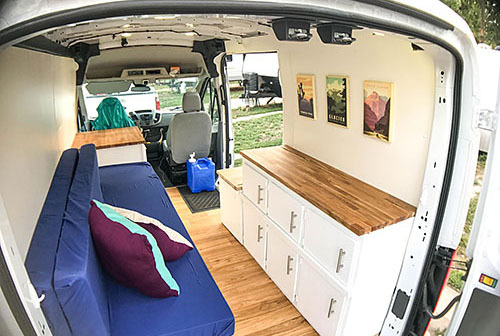 Each side can fold up for maximum floor space (hauling gear, for example), to bench seats with a screw-in table, or add a central piece to form a bed without any central supports blocking storage underneath. 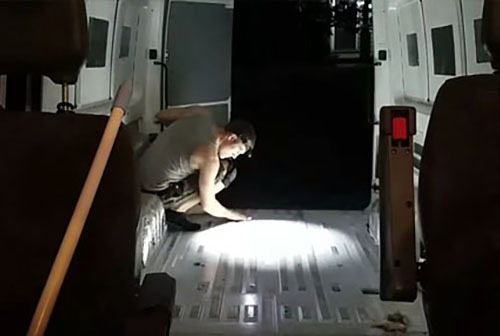 Check out the video tour for the full run through. 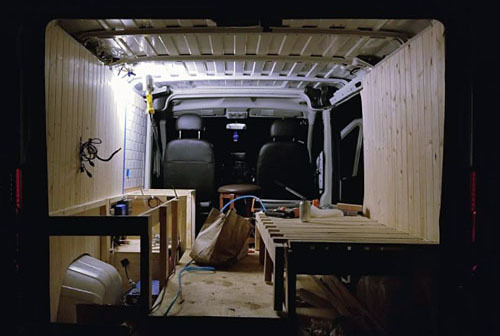 The key to this van conversion layout is the tambour table hidden in the kitchen unit which pulls out and combines with the bed-side bench seat to make a useful dining or work area. 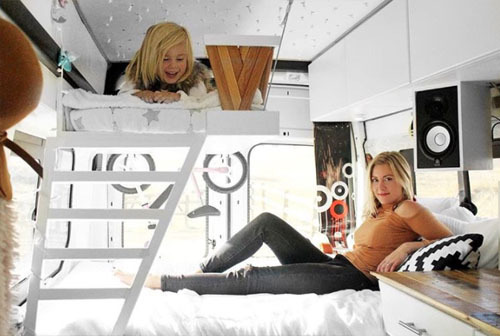 Scaled-down living is all about tricks like this. 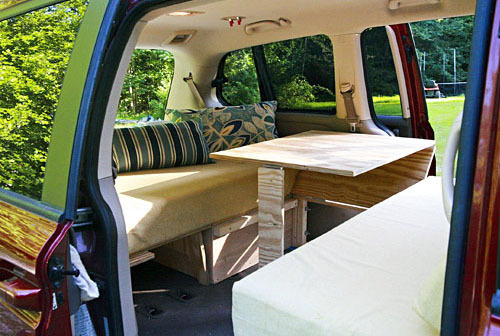 A seriously clever use of a Kia Sedona retaining a third seat but creating an easily converted bed and table platform. 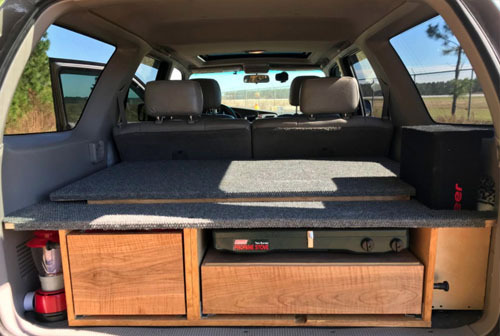 Plus a bonus kitchen unit accessed from the tailgate. 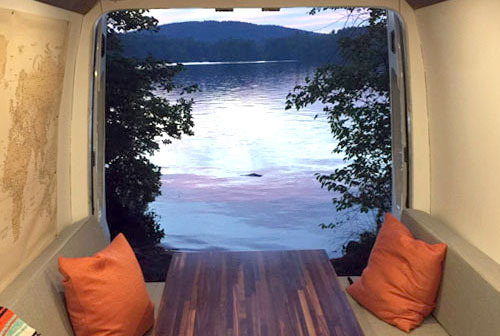 This will change the way you think about people-movers. 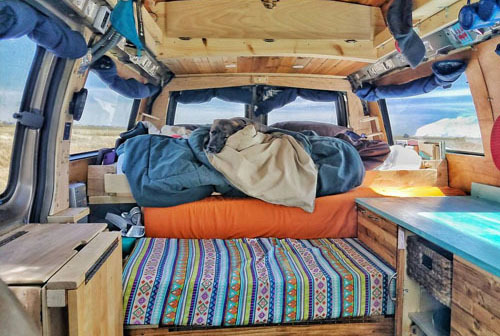 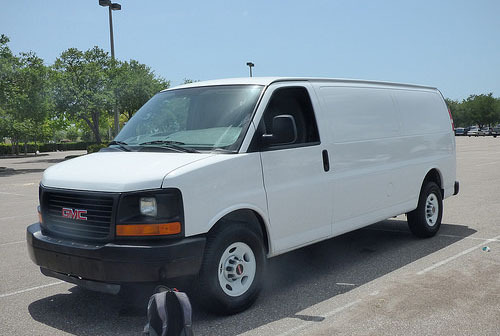 2004 Dodge Sprinter 2500 High Top 140"
This vintage Toyota has a pop-top for headroom, a convertible bed, and took a serious amount of time and effort to restore. 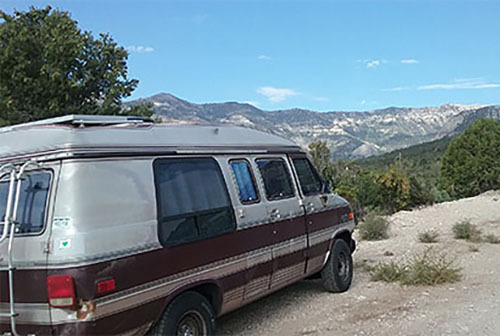 Aric has all the detail you could want on his personal site and build blog. 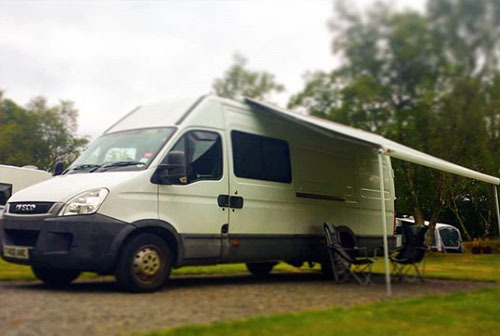 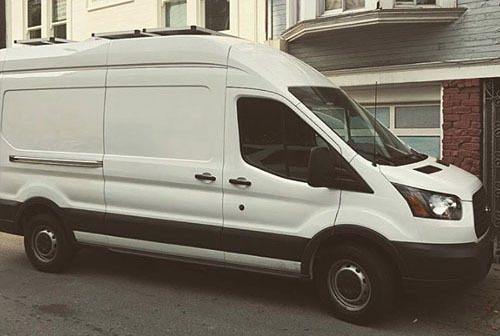 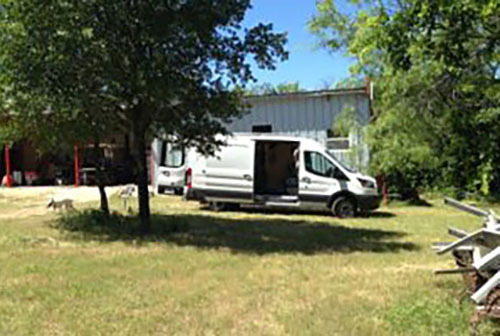 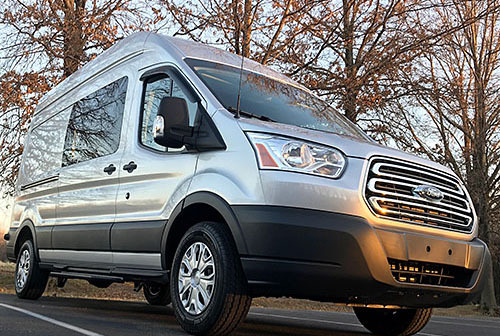 With a shorter wheelbase, this Ford Transit conversion opted for simplicity - no large garage, but three storage areas, of which two have bench space. 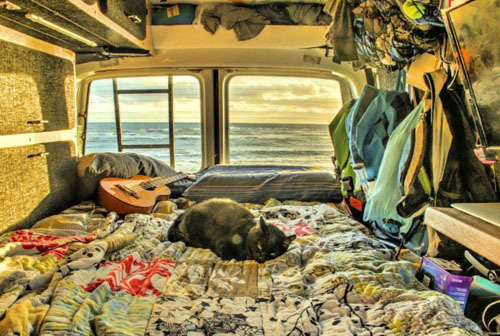 The couch converts to a bed oriented length-wise. 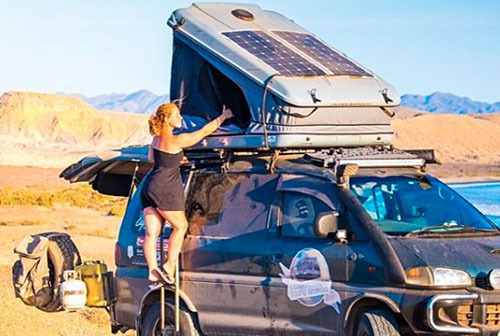 This is a travel minivan that forgoes stealth for the space efficiencies that come from using a James Baroud roof-top tent rather than chewing up space inside the van. 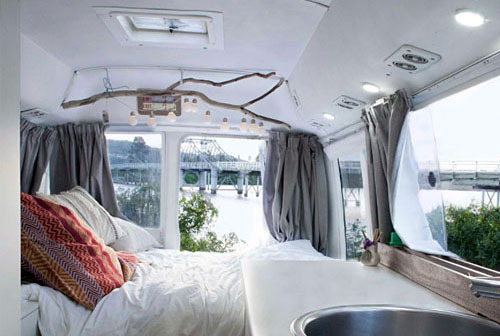 That said, there is provision to create a second sleeping space for guests if required. 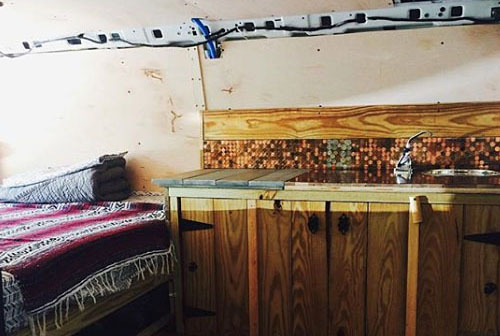 Like typical 4x4 builds, there's a practical slide-out kitchen at the back. 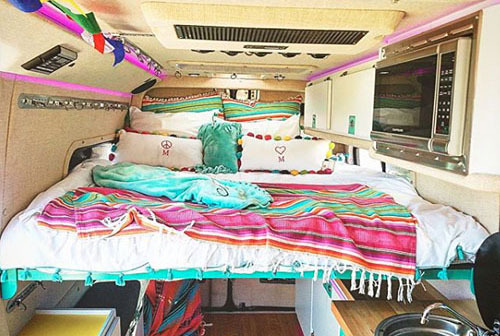 A dad and his two daughters in a colorfully, professionally converted Sprinter. 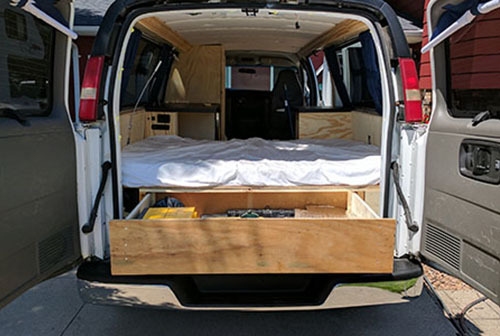 Of note in this build is the convertible bed with panels which can pack away to create open space. 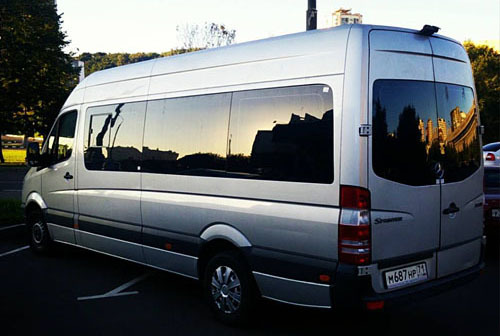 A bench seat for three is retained in the van for the children and any guests. 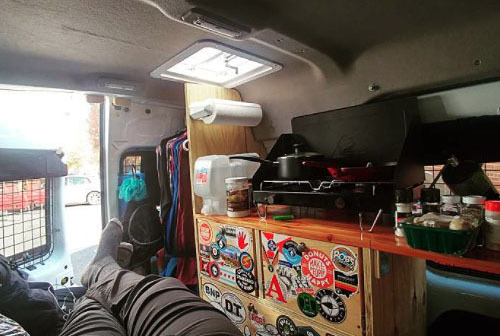 Here's a good example of a bed running lengthwise beside storage cupboards in a Sprinter van conversion. 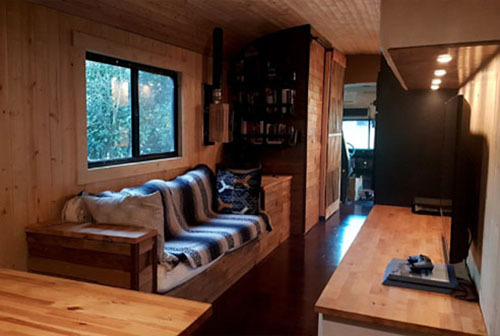 The owners have bench surfaces on both sides (with the sink on the door side) and still managed to accommodate bench seats with a slide-out table/desk. 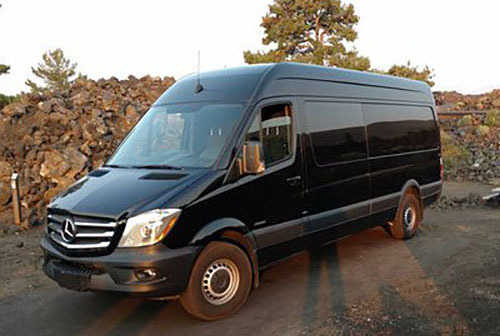 Great use of a 170" wheelbase Sprinter. 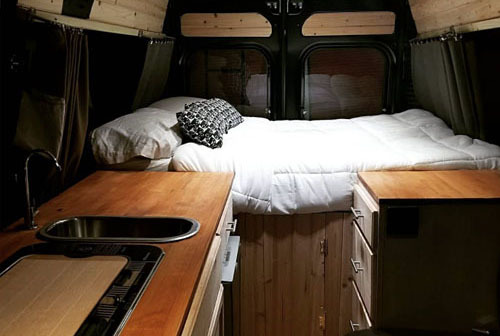 Dark floors, rich timber benchtop and a unique patterned ceiling make this a great looking but affordable van conversion. 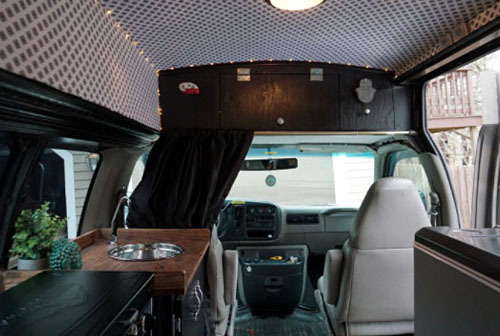 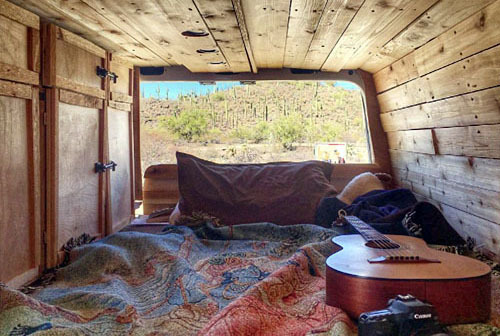 In this case, a former Chevy handicap van build with its own style. 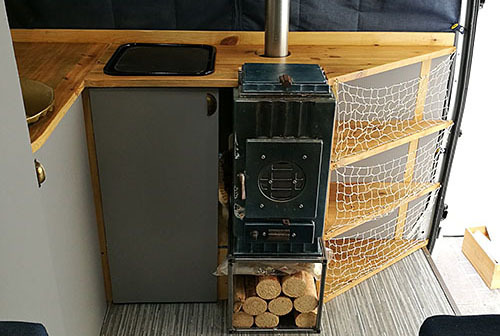 This was a renovation of an existing camper conversion but still a fantastic upgrade - fresh paint, laminate over the older floors, new curtains, etc. 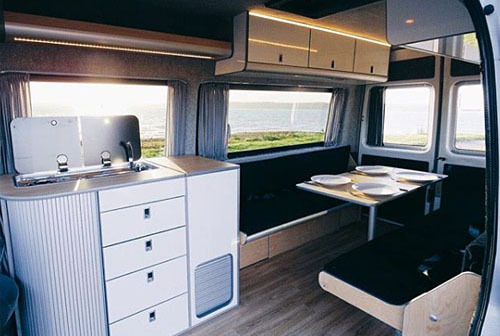 The owners convert between two bench seats with dining table and a bed with cushion mattress as required. 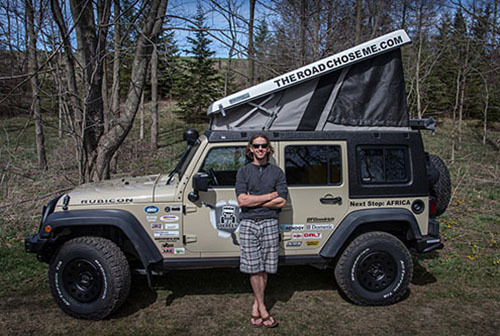 Dan's done this before with his previous trip covering both North and South America, so this customized jeep prepped for a two-year jaunt around Africa is based on experience and purpose. 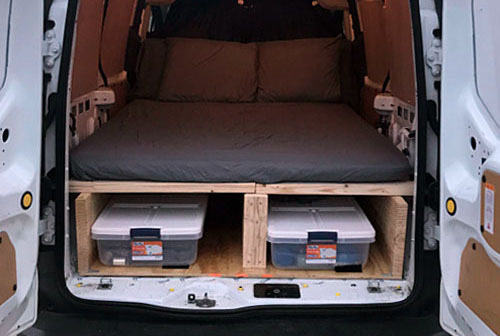 In this setup, the storage boxes can be shuffled depending on needs while sleeping space is added with the pop-up camper top. 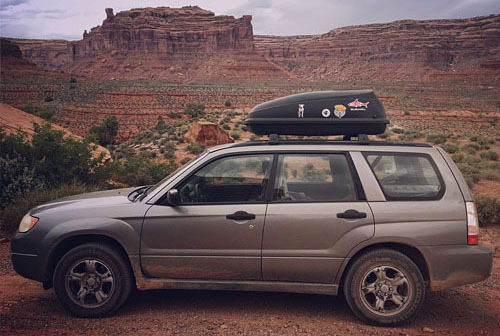 It's tough to make a car conversion glamorous like bus and van conversions, so here with Becca's Subaru Forester conversion, practicality is king. 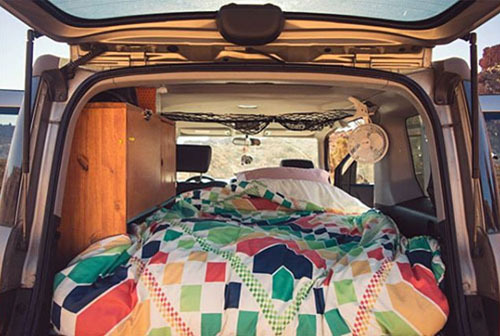 Forgoing most cooking has enabled a focus on sleeping and storage. 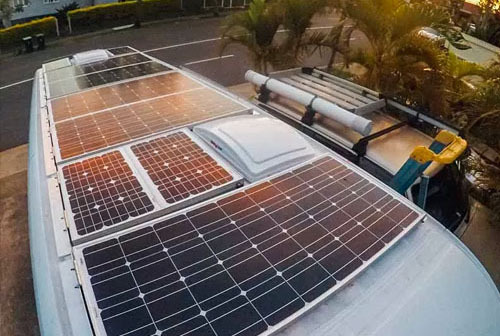 The roof pod helps but could be omitted for stealth. 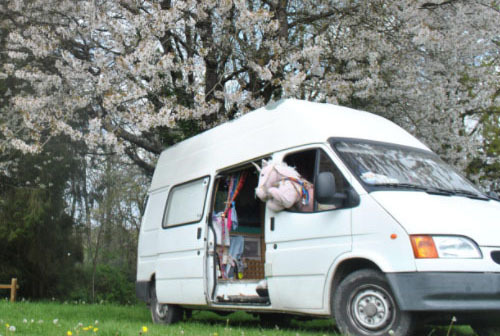 The sheer travel mileage shows it's all worked well. 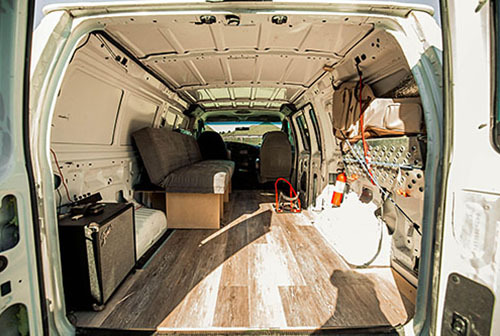 Here's a stealthy Ford Econoline E150 van conversion where every bit of space is utilised. 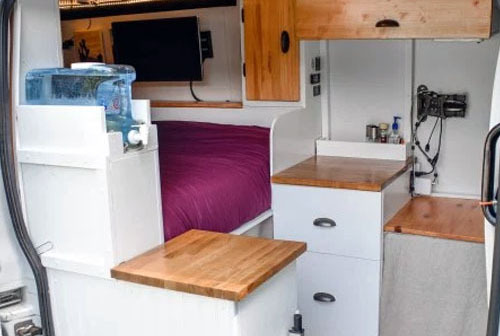 Sideways bed over storage, interior kitchen unit but also a rear fold-out cooking space. 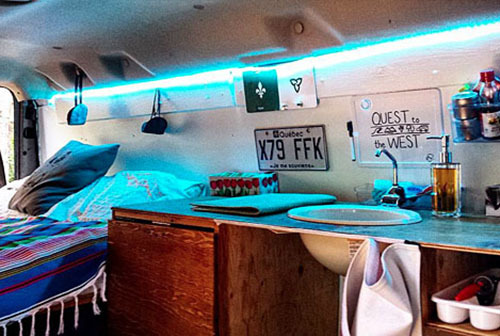 It's more practical than pristine and a great example of a budget van conversion. 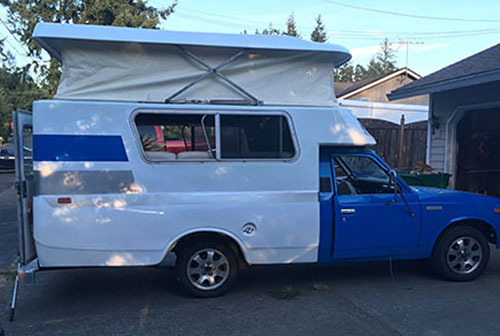 Car-based builds don't need to be overthought and there are usually few layout decisions to make. 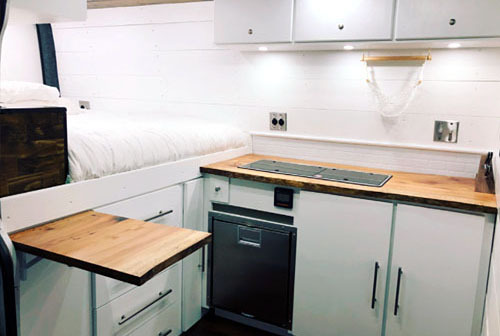 This setup uses the common and efficient setup of a bed platform over storage with a rear-oriented slide-out kitchen. 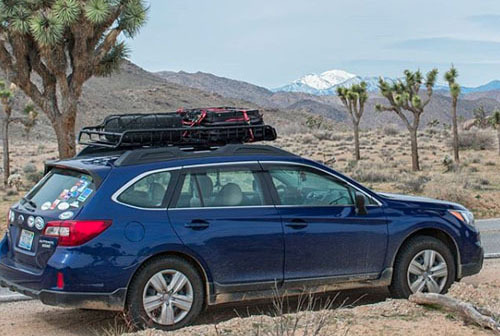 Extra storage is gained via roof-racks. 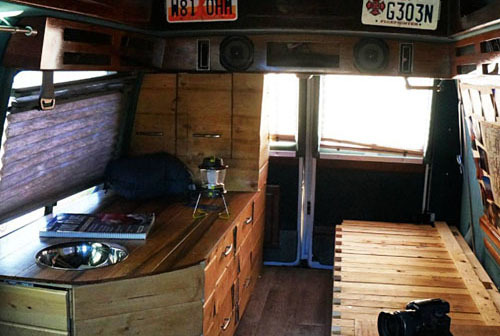 Wood panelling is the name of the game in this 24' school bus conversion. 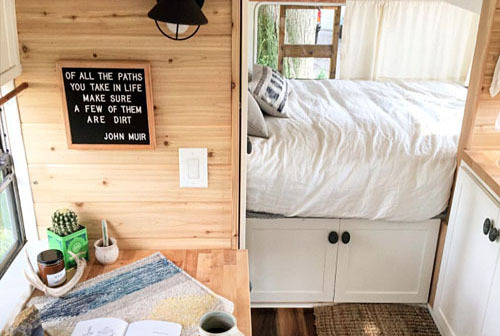 Heavy maybe, but certainly homely. 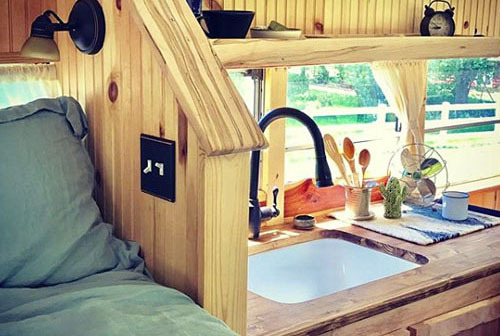 With the extra space provided by a skoolie comes a full-size sink and faucet, and loads of bench space. 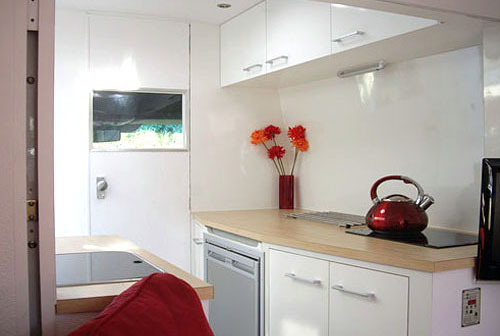 Layout from front to back is cabin, lounge area, kitchen, bedroom. 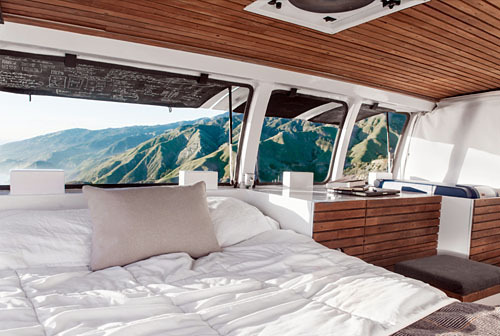 This school bus conversion is not just a beautiful piece of work, but includes some clever additions like the roof-top deck complete with hammocks. 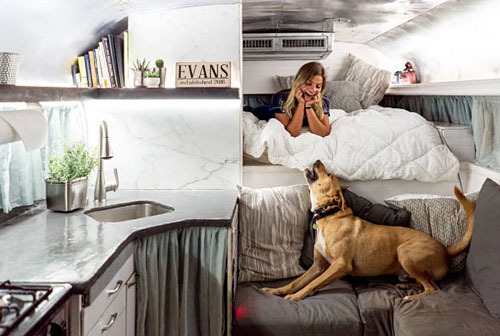 Obviously with the size of a 24' bus, the openness is a huge benefit - providing lots of seating in this case and a solid kitchen. 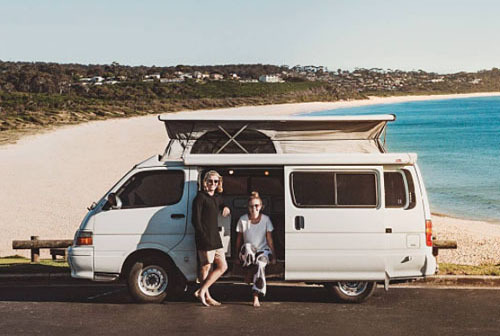 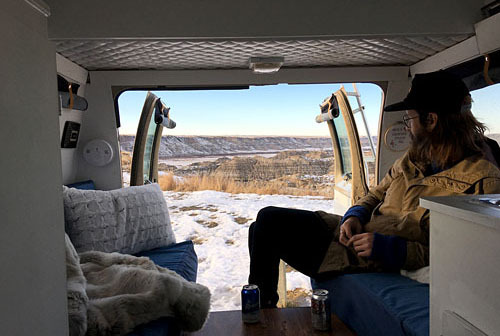 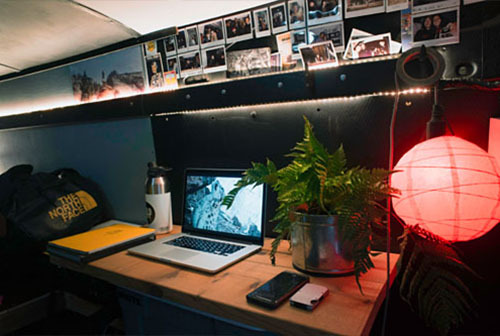 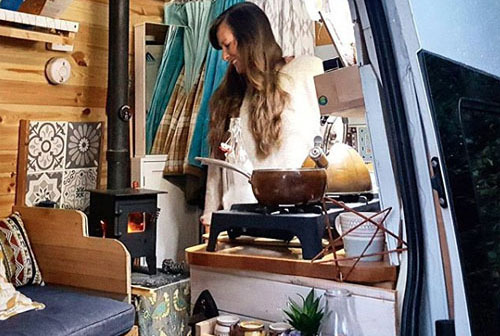 This budget van setup puts practicality first, eschewing insulation and preferring to move where the weather is more liveable at any given point in the year. 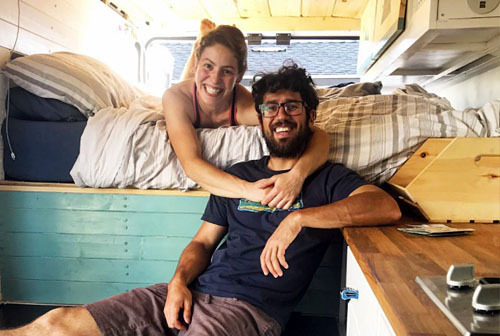 There are a few standouts in this attractive Ford Transit conversion but the two best are the loft bed for the couple's daughter and robust and versatile slide out deck from the under-bed garage. 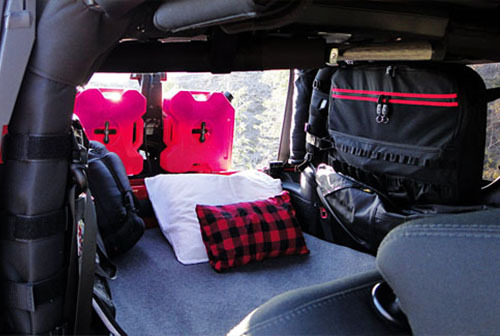 If you're spending every day in your vehicle, you might as well make it a rewarding and multipurpose place to be. 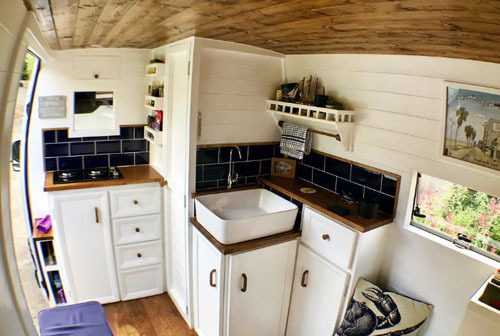 White and wood always seem to resonate with people and this Sprinter conversion is no exception. 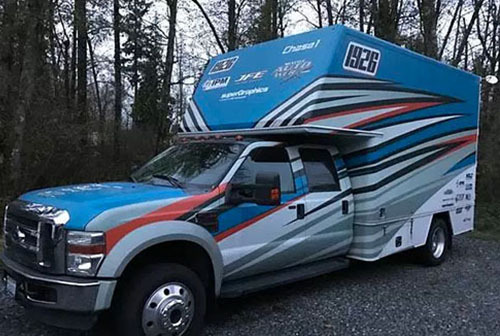 It's not one of the longer Sprinters (144" wheelbase), but makes the most of a compact space with a neat elevated bed platform over the garage and bike storage, then a solid kitchen setup with integrated cooktop and sink. 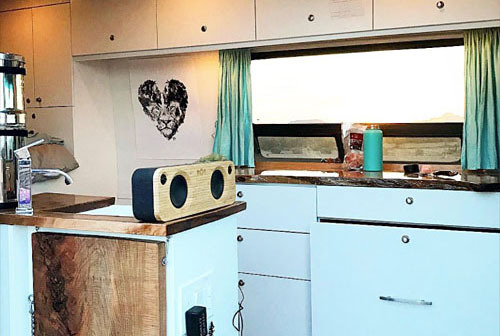 The exterior of this short bus conversion belies a very stylish interior with custom cupboards and sofa, plus an attractive kitchen. 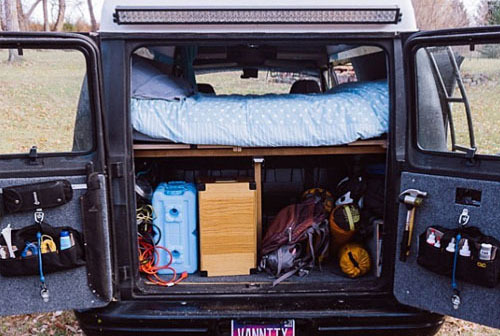 It's a spacious but practical layout too.